So, how many times can you get over the cancellation of the TMNT Adventures conclusion, "The Forever War"? Having first been canceled when the title itself was canceled in the mid-90s, and after several on-and-off broken promises throughout this decade that Mirage would publish the 5-part story, fans were given hope that the project might actually see the light of day as it was put on Mirage's schedule as part of the 25th anniversary celebration. As such, a lead-up TPB was released in July that collected key stories that would lead up to what we would see in "The Forever War." Unfortunately, circumstances seemed to put the project into a holding pattern and its release once again became uncertain. Now, in light of the recent purchase of the TMNT by Nickelodeon/Viacom, Mirage has been forced to make a definitive decision on the fate of this title, and, unfortunately, the news isn't good news. In an e-mail to long-time TMNT fan Andrew M., Steve Murphy has made it official that the story is canceled and will not be published. To get a look at the story that might've been, you can head on over to Murphy's old 5th Turtle blog to see a small glimpse. PanelToPanel.net has posted the "Future Tense" trade paperback for pre-order! While supplies last, all copies of "Future Tense" ordered from PanelToPanel.net will include an exclusive bookplate featuring brand new art by TMNT Adventures artist Chris Allan. This book contains some of my all-time favorite TMNT stories, so you definitely don't want to miss it! Mirage Studios' first trade paperback collection of Archie Comics' "TMNT Adventures," collecting 8 issues of the classic comic book series: #42-44 ("The Future Shark Trilogy") and #62-66 (the "Dreamland" 5-issue story arc). All issues feature the "future Turtles" and act as a lead-in to the upcoming all-new "Forever War" mini-series! 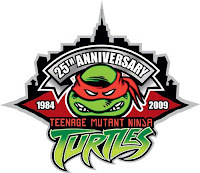 Next year is the twenty-fifth anniversary of the first “Teenage Mutant Ninja Turtles" series. The original first eleven issues and individual character solo one shots, long out of print, are being collected in hardcover for May publication from Mirage. This will be accompanied by an Official Handbook To The Mirage Universe style book, profiling Turtle and spinoff characters in all their various forms. The “Forever War" story from the Archie "TMNT Adventures" comics will be published and completed, written by Steve Murphy who wrote the originals under the pseudonym of Dean Clarrain, with art by Chris Allan. A Donatello mini-series to close out the yearly individual Tales series is entitled "Brain Thief." Archie Comics will also reprint the original three-issue mini-series from Michael Dooney in their manga trade size with all new colouring. Even factoring in Mirage's continued refusal to put their books in bookstores (very stupid), all of this is very good news! The biggest question mark is the Donatello mini-series. The series itself is a predictable part of the '09 plans, but hopefully it'll actually be about Donatello (unlike the Michelangelo series) and also hopefully it'll actually be good (unlike both the Raphael and Michelangelo series). Thanks to both Jake Black and Will Tupper for the heads-up! This week, Ryan Brown, creator of the C.O.W.-Boys and creative force behind too many TMNT projects to list here, revealed that the C.O.W.-Boys will return for a fourth and final time next year in Tales of the TMNT #58. Like past crossover issues, Dario Brizuela will be contributing his fantastic skill and style to the pencils for the issue. He's already completed the cover, which you can check out in full--along with more awesome pieces of art--over on Ryan's C.O.W.-Boys blog. And don't forget to sign the C.O.W.-Boys of Moo Mesa DVD petition while you're at it! The previous post on Mirage's unique postage meter stamp brought up a conversation in the comments about the postcards Mirage would send in response to fan mail and/or fan art. Tonight I dug out the postcard I received in response to some fan art I apparently sent (I clearly recall receiving this postcard, but I can't for the life of me recall the art I sent). 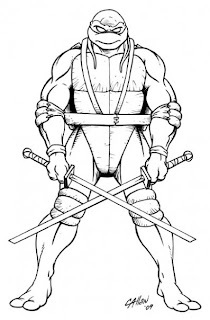 The front of the card shows the line art from the cover of TMNT Adventures #18. If you look closely on the back you'll see that same Raphael postage meter stamp (all the blots are from the residue of poster putty I used to hang the postcard on my bedroom door for years). The postmark date is September 17, 1991. 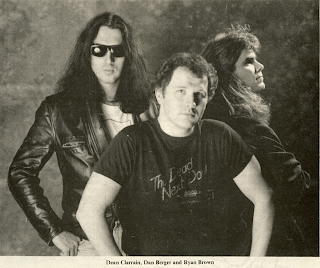 Man, that was forever ago! Did you ever receive this or a similar postcard? Still have it? Send me a scan! Ryan Brown adds: We gave Murph's girlfriend at the time the task of answering all the TMNTA fan mail. She did a phenomenal job!! We'd print up the postcards using different TMNTA cover art at a local printer and then give them to her to mail out. Murph and I wanted to send something special to the kids who took the time to write in. I'm not sure how many different covers we used for the postcards but I believe we utilized quite a few. Murph and I loved to read the fan mail. We personally signed and sent the first few but suddenly the amount of mail increased so much that we had to pass it along to someone full time and that dude was a newly arrived Dan Berger. As Dan's workload increased Murph's girl friend stepped in. 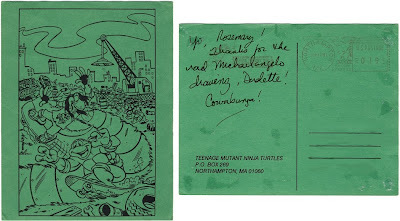 A couple weeks ago, the TMNT world was rocked on its heels when Steve Murphy officially let it out of the closet that he was, in fact, the one and only Dean Clarrain, writer of virtually the entire TMNT Adventures title from Archie Comics. Even though it hadn't before been made official, I had thought more people had figured it out. But it seems those of us who had were in a minority. 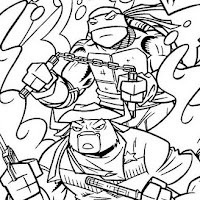 To celebrate this outing, I present to you Comics Interview #83, featuring an interview with the team behind the TMNT Adventures title: Dean Clarrain, Ryan Brown, and Dan Berger. As for the full interview itself, you can download it, for a limited time only, by clicking here. Enjoy! Regular readers of The 5th Turtle know that Murphy has taken the last five days to tell the story behind The Forever War and why it never saw print in issues 71-75 of the Archie comic book series, as was originally planned. We still have over a year to wait to see this story in print, but in the spirit of the Holiday season, today Murphy has gifted us with the first six pages from this story. You can read these six pages at The 5th Turtle, here. 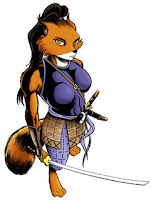 This image comes from inside the pages of the Teenage Mutant Ninja Turtles Adventures comic series from Archie. 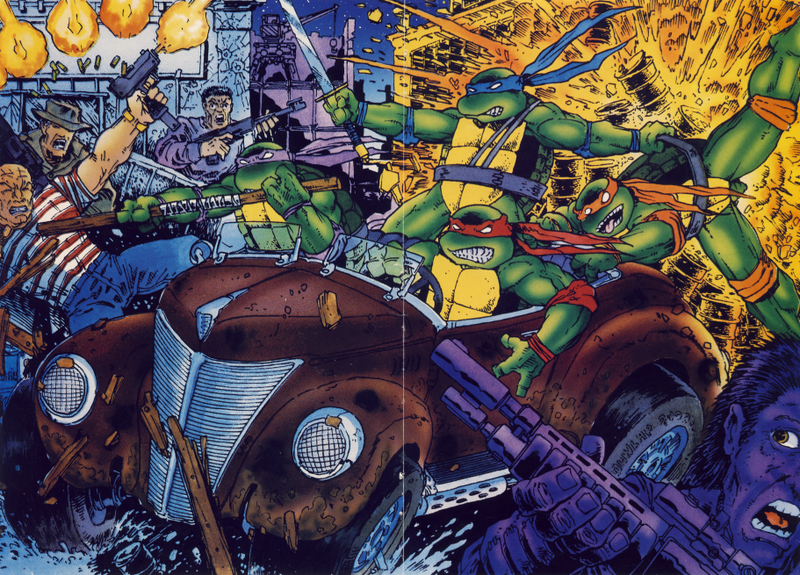 This collaborative work by Kevin Eastman and Peter Laird was a pullout poster inside issue #50. Published in 1993, this is probably one of their final joint artistic efforts.